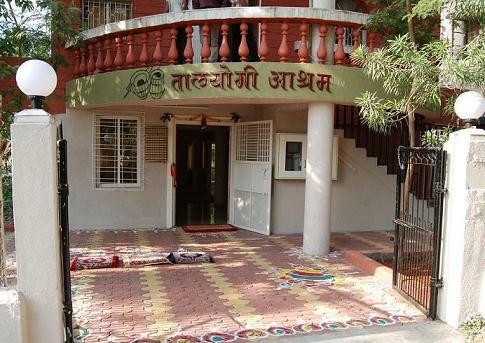 The Taalyogi Ashram, the Gurukul where Padmashree Pandit Suresh Talwalkar teaches a number of young dedicated students, is situated in Dhayari, a suburb of Pune about ten kilometers from the city. It is located in a three storied bungalow, where some twenty odd students live and learn tabla and pakhavaj from Sureshji. He also teaches a few percussionists who play other instruments like Djembe, Kalabash, etc. Panditji himself spends four to five hours in the morning and another four to five hours in the evening at the Ashram, teaching students the intricacies of laya and taal. Students do rigorous riyaz at the Ashram for the rest of the time. enough to convince them that there are still at least a few Gurus who have kept it alive and are imparting vidya to young shishyas who aspire to make a career in music. Taalyogi Ashram is located in Dhayari, a suburb of Pune about ten kilometres from the city. One of Panditji's senior students, Dr. Srinivas (Shri) Rao has made his three storied bungalow available to Guruji for his Gurukul. The bungalow has living facilities for around 25 students. These students, ranging from around 15 to 25 years of age live at the Ashram and get intensive taleem directly from Guruji seven to eight hours a day. The rest of the day they do rigorous riyaz. They also have the responsibility to keep the whole Ashram neat and clean. One of Guruji's senior students, Mandar Joshi who lives nearby maintains discipline among the students at the Ashram. Most of the students come from a very modest economic background, and pay just their living expenses and are not charged any fees. All of them are training to make a career in music as performers and teachers. The initial funding for renovating the bungalow in which the ashram is housed, and for purchasing the basic amenities for students staying at the ashram, was generously provided by Pt. Firoz Dastur Memorial Foundation and many other individual donors. The ashram now welcomes donations for on-going expenses. For details, please see the "Ashram Trust" page.